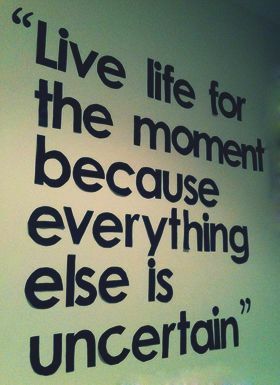 Live for the moment implies living in the present and embracing your current reality. Come what may, one must learn to live in the present moment without ruminating over the past or pondering much about the future. Past is history, future is mystery and present is the present or gift of God. Work towards a better life but do not spend time in contemplating about it so that you can channelize all your energies on working hard in the present moment. One of the key guidelines to successful living is living in your present. Energies and efforts should all be focused on the present which should be thoroughly lived and enjoyed. Life is too short and unpredictable to spend your time in thinking about the future or being a continuous slave of some bitter memories from your past. Hence, the way to live life ideally is to live for the moment and focus on the present and what is at hand.